7-4-02 – Vegetable gardeners enjoy serene anonymity amid the hype and clatter surrounding the hobby of gardening. Immune to the trends and fads that transfix their flower-growing brethren, vegetable gardeners generally keep their heads down and their hands in the soil, blissfully flying beneath the gardening industry’s relentless radar. They certainly make out like bandits from a cost standpoint. From seeds to plants to paraphernalia, vegetable gardeners pay less. Have you priced flower supports lately? I’m referring to the wire hoops, half-hoops, and other contraptions for sale to flower gardeners to keep phlox corralled tight, lilies from snapping in the wind, and peony blooms from kissing the ground at the first hint of rain. One lily support – a single strand of stiff wire curling to a polite circle at the top – costs around two bucks. A large hoop of wire (though rarely large enough to contain a mature peony bush) with three support legs will run you four. One day I was standing in line at the garden store, clutching about a hundred dollars’ worth of wire perennial supports, when I noticed the stacks of round, telescoping tomato cages. You know the ones I mean. They too are made of stiff wire, and there’s a small circle, then a foot higher a medium circle, then a big circle at the top, all held together by three long metal legs running from the big circle down to about a foot past the little one. They cost exactly $1.98. As I computed the number of large hoops, short hoops, half-hoops and single-stem hoops a person with a hacksaw could fashion out of two or three tomato cages, I realized that flower gardeners have been duped. One medium perennial hoop costs about three times more than one large tomato cage, even though the tomato cage is comprised of three times the amount of wire, not to mention all that additional spot welding activity. Why are the flower gardeners getting gouged? Because industry research shows we’re a bunch of Macanudo-smoking, Land Rover-driving, Martha Stewart-subscribing, micro-brewery-imbibing, hedonistic yuppies trying to decide if Mexican beaches are yesterday’s news. We’ll pay four bucks for thirty-eight cents worth of wire – six bucks if you coat it with five cents worth of green plastic. Meanwhile, the garden industry perceives vegetable gardeners as being only one generation removed from farmers and thinks, hell, these people don’t even buy food, they grow it. How much profit can we possibly get out of them? So tomato cages cost $1.98. Vegetable gardeners have been let off the avarice-tipped hook. Make a quick segue from just about any flower catalog to a vegetable seed catalog, and note the differences. Most national nurseries selling perennial plants and print color-drenched catalogs on paper as slick and glossy as the best magazines. But grab a vegetable-only booklet, and you’ll need to take care so that the newsprint doesn’t leave ink smudges on your hands and sofa. Vegetable catalogs are heavy on words and light on graphics. Vegetable gardeners know what they want, and can select and order based on written descriptions alone. What vegetable catalog is going to bother with propped and lighted photos of spinach, when a line drawing every few pages will do? When it comes time to order plants, the amount you’ll spend on one of whatever is the new, “must have” hosta will buy you enough vegetable seeds to farm two acres. 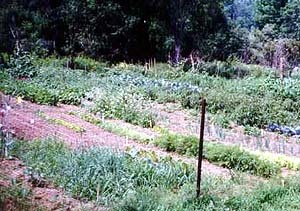 Vegetable gardeners also are freed from many of the trappings of garden design. One needn’t worry about careful juxtaposition of color, form, and texture in plantings. And while location of the vegetable garden should flow and fit into the context of the overall yard design, most important is to plunk the plot out of wind, in a spot granted fullest sun. Vegetable beds are the one instance when I think edging with wood timbers looks fine. You’re farming, after all, and the straight, no-nonsense look of timbers befits the utilitarian task at hand. For far too long I considered vegetable gardening a peripheral form of our joyous hobby. Of late, I’ve come to realize its devotees may be the truest gardeners of all. Vegetable gardeners do indeed grow food, for themselves, neighbors, food shelves, or anyone lucky enough to happen by the day produce is being picked. Straw hats on heads, backs to the sun, knees to the earth, they humbly nurture their crops to harvest. Vegetable gardeners don’t care how it looks, they care how it tastes, and who am I to judge one sense as finer than another? Last weekend I took in the annual Healing Gardens Tour in Minneapolis, fabulous as always, 15 gardens, ranging from the scandalous to the sublime. Here’s a look at noteworthy Twin Cities tours yet to come. Grab your water bottle, sunscreen, fill the tank of the SUV, and get out there! 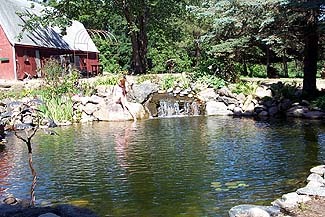 14 or so elaborate, private water gardens, plus 100 more, most of the do-it-yourself variety.